Listed below are a few of the most common Washing Machine faults and an explanation of what might be causing the problem and how to fix it. A. If the washing machine is still filling with water and it drains away correctly but the drum does not turn, it is more than likely a faulty belt. If the belt that drives the drum has slipped off or snapped then the drum will cease to spin. To correct this problem the belt needs to be replaced. A. The most likely cause of leaking from a washing machine is a problem with the door seal. If the door seal has worn or has a tear then water will penetrate it and run down the front of the washing machine. If the door seal is the problem then it needs to be replaced. Leaks can also be caused be faults with other washing machine components such as hoses, seals or the pump. A. A noisy washer can become irritating over time and also indicates that there is a fault with the drum bearings. If you suspect that the drum bearings are worn, it is a good idea to get them repaired as soon as possible as it can affect other parts of the washing machine. If there is a problem with the bearings the drum may feel loose or there will often be a brown rusty stain towards the back of the machine. A noisy washer can also be due to loose components inside the machine or because the machine is not standing squarely on all four feet. A. If your door has jammed shut after use this is likely to be because the water has not completely drained away. It can be very frustrating especially if your laundry is trapped inside. If your machine is retaining water this could be due to a blockage or a pump failure. When the door jams it could also because the door interlock has jammed or the catch/handle has broken. Don't be tempted to force the door open as this can cause more damage. A. If you live in a hard water area then you should take steps to prevent limescale build up on the internal components, such as the heating element, drum, pipes or hoses. 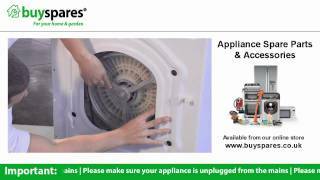 Over time limescale damage can cause components to fail and shorten the lifespan of your washing machine. 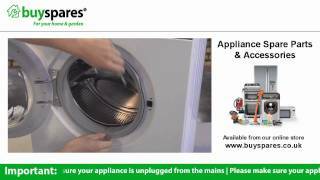 For more information on limescale damage read our 'How do I combat limescale build up in my dishwasher?' article.